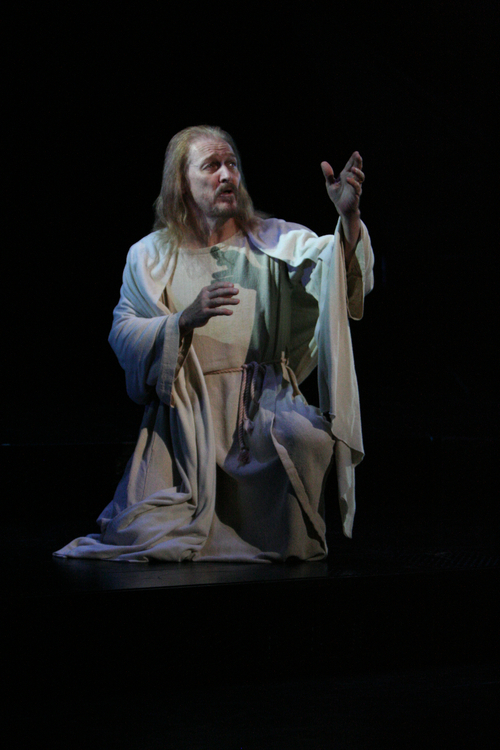 Review • Neeley plays Jesus, fortified by a cast of true believers, in Park City. There are plenty of reasons to feel sorry for all the fuddy-duddies offended by Tim Rice and Andrew Lloyd Webber's "Jesus Christ Superstar" when the musical hit a Broadway's stage in 1971. Looking back now, in an era where Evangelical youth form their own God-centered rock bands, this granddaddy of all rock-opera music seems downright quaint. It boasts a musical soundtrack with "wah-wah" electric guitar solos and "groovy, man!" ethos. And the script makes an earnest attempt to fit the founding figure of the world's largest religious movement into a pair of brand-new contextual sandals. It's only when you see the production again, as they say, for the first time, that you realize why it sparked so much controversy throughout the 1970s and beyond. Stephen Sondheim may have given us the first musical to shock with "Sweeney Todd." Webber, teamed with Rice, gave us perhaps the first truly revolutionary musical. You'd be well within your rights to dislike "Superstar." All the Webber trademarks are here. Its songs are linked in the style of a chain-smoker who can't pause long enough to enjoy the fresh air of dialogue. It's stuffed with cramp-inducing, hyperbolic scenes that demand hyperventilating acting. And yet, "Superstar" asked us by the millions to reconsider a figurehead we were so certain we already knew. Without it, the Jesus Seminar of scholars who dared summon the historical Jesus against official church versions might have waited longer than 1985 to start work. You won't find a more authentic standard-bearer for the role than Ted Neeley, cast 1971 for the Broadway production directed by Tom O'Horgan,then again for the 1973 film version directed by Norman Jewison. Ye of little faith might say that Neeley's voice thins during his "sotto voce" lines, lending shaky turns here and there to his umpteenth turn at the part for The Egyptian Theatre Company's production, running through Dec. 31. And at 68, it must be said he can't quite convey the Savior's radical fire in ways a younger actor could. 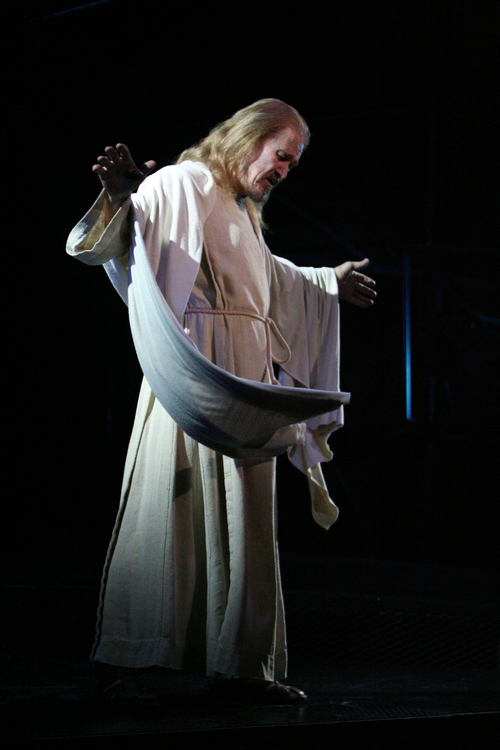 But Neeley still hits those famous high notes with aplomb  most notably in "The Temple" scene  and he's got every facial expression nailed to pious perfection, all the way down to crucifixion time. Most important, his mere presence seems to rally the ensemble cast to play every scene for all its worth, despite the limits of the Egyptian's small stage and absence of a musicians' pit, which means treacherous competition with the backstage band for every singing part. William Richardson as Simon lends the production a vital sense of "hippie" flavor throughout, with Jonathan Scott McBride camping up "Herod's Song" for all its worth. The central roles of Judas, played by Carleton Bluford, and Mary Magdalene, played by Kate Smith, remain stalwart throughout as well. Bluford, in particular, offers a robust, tortured Judas ripe with confusion, contempt and regret at the character's every turn. By the time Smith sang "I Don't Know How to Love Him," the audience had been placed firmly back in the loving cradle of the 1970s. That's no small feat. All that's holding this production back from its heavenward aspirations, really, is the small stage and dampened acoustics of the Egyptian Theatre itself. So, while not quite a religious experience, and certainly no miracle, this "Superstar" inspires all the same. Ted Neeley redeems the role as Son of God once more in a production that, while not a miracle, consistently inspires. When » Through Dec. 29, 8 p.m.; and Friday and Saturday, Dec. 30, 31, 5 and 8 p.m.
Info » $40, at 435-649-9371 or http://www.egyptiantheatrecompany.org. Running time • Two hours, including one 15-minute intermission.